Isoforms of the casein kinase 1 (CK1) family have been shown to phosphorylate key regulatory molecules involved in cell cycle, transcription and translation, the structure of the cytoskeleton, cell-cell adhesion and receptor-coupled signal transduction. They regulate key signaling pathways known to be critically involved in tumor progression. Recent results point to an altered expression or activity of different CK1 isoforms in tumor cells. This review summarizes the expression and biological function of CK1 family members in normal and malignant cells and the evidence obtained so far about their role in tumorigenesis. Protein kinases represent an important therapeutic target for drug development since they play a central role in signal transduction. By reversible phosphorylation of their substrate proteins, kinases exert influence on substrate activity, localization and function and thus play an essential role in almost all cellular processes. The casein kinases (CK) belong to the serine/threonine kinases and can be subdivided further into either casein kinase 1 (CK1) or casein kinase 2 (CK2) families due to their high homology in their catalytic domains . This review focuses on the isoforms of the CK1 family, which have non-redundant and essential functions in cell survival and tumorigenesis . 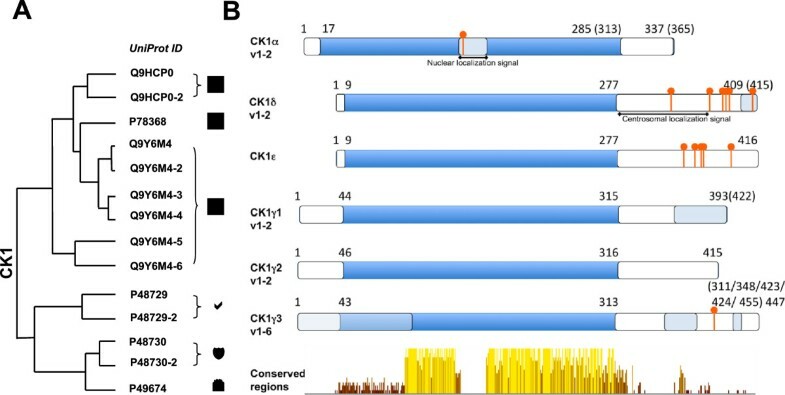 In vertebrates, seven CK1 isoforms (α, β, γ1, γ2, γ3, δ and ϵ) and several splice variants for CK1α, δ, ϵ and γ3 have been identified [1, 3]. The CK1β-isoform has only been found in cows. They differ in length and sequence of the N-terminal (9–76 amino acids) and especially the C-terminal (24–200 amino acids) non-catalytic domain (Figure 1). By this, the molecular weight of the various CK1 isoforms ranges from 37 kD (CK1α) up to 51 kD (CK1γ3). The C-terminal domain plays a crucial role in substrate specificity and in the regulation of kinase activity [1, 3–5]. The isoforms show a high homology, i.e. CK1δ and CK1ϵ are 98% identical in their kinase domain and 53% identical in their C-terminal regulatory domain . Therefore, there is some redundancy with respect to substrate phosphorylation - however, there are also examples of distinct biological roles for the different CK1 isoforms. Structure of casein kinase 1 family members. (A) Homology tree of the casein kinase 1 family consisting of six human casein kinase 1 isoforms: alpha, delta, epsilon, gamma1, gamma2 and gamma3. All available and corresponding protein sequences were retrieved from UniProt (see IDs) and the aligned sequences were used to calculate the average distance tree (using the BLOSUM62 algorithm) visualized with jalview. (B) Schematic drawings of the isoforms show conserved regions (yellow color) especially within the kinase domains (dark blue). Variable regions due to transcript variants and alternative splicing are depicted in light blue resulting in variants differing in protein length: CK1α: 337/365 aa; CK1δ: 409/415 aa; CK1ϵ: 416 aa; CK1γ1 393/422 aa; CK1γ2: 415 aa; CK1γ3: 311–455 aa. Phosphorylation sites (red) are occurring predominantly at the C-terminal ends of the delta (Ser331/370/382/383/384/411) and epsilon isoforms (Ser343/354/362/363/389) and are known to be auto-inhibitory. An additional phosphorylation site can be found within the 28 aa insertion of CK1α (Ser156). A nuclear localization signal is located in the long variant of the alpha isoform (aa 160–163). A centrosomal localization signal  is located at the C-terminus in the delta (aa 278–364) isoform. In recent years an increasing number of substrates have been identified that are phosphorylated by CK1 isoforms in vitro or in vivo[1, 4, 5]. Several known substrates especially of the CK1α and δ isoforms are involved in oncogenic signaling pathways as Wnt/β-catenin (β-catenin; dishevelled (DVL); adenomatous polyposis coli (APC); nuclear factor of activated T cells, cytoplasmic 3 (NFATC3)), p53 (p53; p53/E3 ubiquitin-protein ligase Mdm2 (MDM2)), PI3K/AKT (forkhead box protein O1 (Foxo1)), and death receptor signaling (Fas-associated death domain protein (FADD); BH3-interactive domain death agonist (BID)). In addition, various interaction partners have been identified from which it is not known yet whether they can serve as a CK1 substrate. These include proteins that are involved in cell cycle, apoptosis induction, DNA repair, mitochondrial function and signal transduction. Moreover, several proteins involved in oncogenic signaling pathways are predicted to interact with the different CK1 isoforms (Table 1). These proteins mainly belong to the Hedgehog (GLI), Hippo (MST, YAP), Wnt/β-catenin (Axin, Dvl1-3, FZD1 and 5, GSK3, Wnt3A), NFκB (NFκBIA), TGF-beta/Smad (Smad3) or p53 (MDM2 and 4) -signaling pathways and hence are involved in regulation of the cell cycle, apoptosis induction or cell survival. Many of these interactants are known to be deregulated in tumor cells and interaction with CK1 isoforms might trigger tumor initiation or progression . CK1 substrates are shown with known phosphorylation sites together with the involved cellular processes of the corresponding proteins. The following programs were used for determination of interaction or phosphorylation: http://string-db.org, http://hprd.org; http://regphos.mbc.nctu.edu.tw, http://www.phosphosite.org. Only proteins validated by biochemical assays are shown. A distinctive feature of CK1 family members is their exclusive need of ATP to phosphorylate their substrates and their independency of other co-factors. They show a strong preference for primed, pre-phosphorylated substrates . Surprisingly, the substrate specificity defined in vitro differs from in vivo for the different CK1 family members  suggesting that the in vivo specificity is regulated by interaction partners, autophosphorylation or subcellular localization. Interaction with cellular proteins has been shown to be a major determinant of the localization of CK1 isoforms [31–35] and to either enhance or inhibit their activity [12, 13, 36]. The wide range of substrates shows that the CK1 family members are involved in multiple cellular processes. For example they are involved in the regulation of membrane trafficking, cytokinesis, vesicular transport, ribosome biogenesis, DNA repair, signal transduction pathways and in the circadian rhythm [1, 5, 37]. Up to now most evidence points to important regulatory roles of the isoforms CK1α, CK1δ and CK1ϵ, while the role of the gamma-isoforms are still enigmatic and not very well investigated. CK1α plays a role in the mitotic spindle formation during cell division and in DNA repair mechanisms and participates in RNA metabolism . Antibodies specific for CK1α block cell cycle progression during M phase in mouse oocytes, which indicates that CK1α is required for proper cell cycle progression in these cells [38, 39]. CK1α can be found at the centrosomes, microtubule asters and the kinetochore . In addition, it was shown that mTOR cooperates with CK1α to promote its own full activation via the sustained degradation of the endogenous mTOR inhibitor DEPTOR . Similarly, CK1α regulates apoptotic signaling pathways, however, there seems to be cell type-specific differences. CK1α has been shown to have an anti-apoptotic function in the extrinsic apoptosis pathway. Its inhibition increased Fas-induced apoptosis in Hela cells, whereas the overexpression of CK1α delayed cell death, caused by the phosphorylation of BID, which prevented the caspase 8 dependent cleavage of BID . In addition, CK1α inhibits TRAIL induced apoptosis by modification of the TNF receptor or FADD at the death-inducing signaling complex (DISC) . Therefore downregulation of CK1α leads to an enhancement of TRAIL-induced cell death. Likewise, CK1α promotes cell survival by interacting with the retinoid X receptor (RXR). Downregulation of CK1α enhances the apoptotic effect of RXR agonists . In contrast, overexpression of CK1α in metastatic melanoma cells induces apoptosis . In addition to the regulatory function in apoptosis signaling pathways, CK1α is involved in the phosphorylation of G-protein coupled receptors (GPCRs) such as the M3 and M1 muscarinic receptors and rhodopsin . These become phosphorylated by CK1α upon agonist-induced desensitization [45, 46]. Furthermore, CK1α is involved in the phosphorylation of NFAT4 (nuclear factor for activated T cells 4), so that its nuclear localization signal is masked and thus the activity of the transcription factor is inhibited [47, 48]. Recently, it was shown in epithelial cells that in response to factors promoting cell motility, CK1α in conjunction with IKKβ phosphorylate the Rap guanine exchange factor 2 (RAPGEF2) leading to its degradation by the proteasome which was shown to be essential for the invasion of breast cancer cells . CK1δ and CK1ϵ are known to be important regulators in the circadian rhythm of eukaryotic cells. The central clock genes period circadian protein homolog 1–3 (PER1-3) cycle in a daily rhythm. Cytoplasmic PER is phosphorylated by CK1, which induces its degradation . When PER is in a complex with cryptochrome (CRY), the phosphorylation site is masked and the complex together with CK1 translocates to the nucleus where it represses another clock transcription factor complex (the BMAL1/Clock complex) and inhibits the transcription of most of the clock genes. Additionally, CK1α was identified as a negative PER1 regulator similar to the CK1δ isoform , however the binding of CK1δ and ϵ to PER proteins seems to be much stronger than CK1α . Pharmaceutical inhibition of CK1ϵ was less effective compared to pan CK1δ/ϵ inhibitors in prolonging the circadian rhythm  proposing a dominant role of CK1δ in the regulation of daily oscillating processes. Taken together CK1s are important regulators of the circadian rhythm [52, 53]. Meanwhile it is known that CK1δ is involved in the regulation of cell cycle progression and it was recently shown that checkpoint kinase 1 (Chk1) is able to interact and specifically phosphorylates CK1δ and by this regulates the kinase activity . Additionally, CK1δ interacts with the spindle apparatus and regulates phosphorylation of α−, β−, and γ − tubulin [35, 54, 55]. It seems to be essential for microtubule nucleation at the golgi . Besides tubulin phosphorylation CK1δ mediates the phosphorylation of microtubule associated proteins (MAPs), stathmin and tau thereby regulating the dynamics of the microtubule and spindle apparatus [34, 35, 57–59]. Recently, it was shown that CK1δ mediates the phosphorylation of Sid4 an important cytokinesis regulator  strengthening the important function of CK1δ in cell proliferation. As CK1δ and Chk1 are known to inhibit p53 via phosphorylation, pharmacological inhibition of both kinases resulted in activation of p53 similar to the effect of the MDM2 inhibitor nutlin-3 . CK1δ and CK1ϵ are able to interact with Sprouty2 (SPRY2), which is a potent negative regulator of fibroblast growth factor (FGF) receptor tyrosine kinase signaling. CK1 activity and binding are necessary for SPRY2 mediated inhibition of FGF-stimulated neurite outgrowth and FGF-dependent RAS activation via GRB2/SOS . It was further shown that CK1δ and CK1ϵ are required for the biogenesis of small ribosomal subunits and for the functionality of 40S ribosomal subunits in protein translation . The CK1 isoforms CK1α, CK1δ and CK1ϵ have a common regulatory function in the Wnt/β-catenin signaling pathway and act in a concerted manner . Dishevelled (Dvl), a key component in the Wnt/β-catenin signaling pathway, becomes phosphorylated by CK1δ/ϵ upon pathway activation by Wnts . Recent evidence indicates that there is a coordinated action of the different CK1 isoforms to activate Wnt/β-catenin signaling in colon adenocarcinoma cells . In these cells CK1ϵ, but not CK1α is required for the early response to Wnt3a stimulation. The two protein kinases function sequentially: CK1ϵ is bound to p120-catenin and E-cadherin and is required for early responses to Wnt3a stimulation, such as recruitment of Dishevelled 2 (Dvl-2), followed by the phosphorylation of the Wnt co-receptors LRP5/6 by CK1γ which leads to the recruitment of axin complexed with CK1α. CK1α then phosphorylates p120-catenin and E-cadherin causing a release of p120-catenin/E-cadherin from the complex, and dissociation of CK1ϵ from p120 which terminates the input signal. For pathway inactivation β-catenin has to become N-terminally phosphorylated. In order to be phosphorylated by GSK3β at the Ser residues 33, 37 and 41, β-catenin must first get primed by phosphorylation on Ser45 by CK1α [63, 64]. Without priming phosphorylation by CK1α, GSK3β does not phosphorylate β-catenin and therefore β-catenin is not degraded. A down-regulation of CK1α thus leads to an accumulation of cytoplasmic β-catenin . In mouse embryonic stem cells DNA damage and its response (DDR) causes an activation of the canonical Wnt signaling by reduced CK1α expression levels. The Wnt signaling was shown to limit the p53 dependent apoptosis induction after DDR indicating a pro-survival effect of Wnt signaling . Recently, the DEAD-box RNA helicase DDX3 was identified as a regulator of the Wnt/β-catenin signaling pathway by acting as a regulatory subunit of CK1ϵ in a Wnt-dependent manner. It binds to CK1ϵ, directly stimulates its kinase activity, and promotes phosphorylation of the scaffold protein dishevelled . Furthermore CK1ϵ is known to phosphorylate adenomatosis polyposis coli (APC) together with GSK3β which leads to an increased affinity of APC to β-catenin causing a transfer of β-catenin from axin to APC. This exposes β-catenin to the β-TrCP ubiquitin ligase marking it for its proteasomal degradation [25, 66]. Additionally CK1δ is capable to regulate the canonical Wnt signaling on the level of lymphoid enhanced binding factor 1 (Lef-1). Lef-1 is phosphorylated by CK1δ resulting in the disassembly of the β-catenin/Lef-1 transcription factor complex thereby inhibiting the pathway . The tumor suppressor protein p53 as well as the p53 interacting proteins MDM2 and MDMX - both capable to regulate p53 activity by inhibitory interaction - are substrates of CK1 isoforms. The three CK1 isoforms CK1α, CK1δ and CK1ϵ are capable to N-terminally phosphorylate the p53 in vitro and in vivo resulting in activation of p53. Furthermore, CK1δ can phosphorylate MDM2, which leads to a reduced interaction with p53 and thus to stabilization and activation of p53 [68–70]. These data suggest that increased expression or activation of CK1α or CK1δ are able to activate p53 and by this increase cell cycle arrest and apoptosis induction. However, there are differences in the ability of the CK1 isoforms to either activate  or inactivate p53 [68, 69] activity depending on the cell types used or the experimental conditions. Knockdown or downregulation of CK1α in the intestinal epithelium of mice , in human colon cancers  or in leukemia cells  triggers p53 activation. Similarly, one study showed that CK1α stably associates with MDMX, stimulates MDMX-p53 binding, and cooperates with MDMX to inactivate p53 . These data suggest that inhibition of CK1α activity increases p53 activity. Indeed, knockdown of CK1α induces p53 transcriptional activity by reducing the inhibitory effect of MDMX for p53  since MDMX phosphorylation is necessary for interaction with p53. Furthermore, knockdown of CK1α reduces the interaction of MDM2 with p53 thus increasing p53 activity . Under stress conditions and when CK1 is highly expressed the situation differs: p53 is activated by an autoregulatory loop between p53 and either CK1α or CK1δ. CK1α stimulates p53 probably by direct phosphorylation of Thr18 and Ser20 [5, 75]. Thereby, CK1α could be a cellular fine-tuning tool for the regulation of p53 activity. It was shown that after genotoxic stress it comes to a transcriptional activation of CK1δ by p53 . Furthermore, DNA damage activates p53 in part by disrupting CK1α-MDMX interaction and reducing MDMX-p53 binding affinity . In addition, DNA damage leads to an enhanced interaction between CK1δ/ϵ and MDM2 resulting in multisite phosphorylation of MDM2 by CK1 and enhanced MDM2 degradation and subsequently enhanced p53 activity. Inactivation of CK1 (primarily CK1δ or ϵ and to a lesser extent CK1α) results in accumulation of MDM2, thus decreased p53 activity and resistance to apoptosis induced by DNA damaging agents . In conclusion, depending on the cell system used, CK1α and CK1δ are able to either increase or decrease p53 activity by direct phosphorylation or modulating the activity of the p53 interacting proteins MDM2 and MDMX. Furthermore, the activity of p53 as well as CK1α and CK1δ is increased under stress conditions pointing to an autoregulatory loop between CK1 isoforms and p53. The expression and activity of CK1 family members seems to be tightly regulated. Protein expression levels can be found at http://www.proteinatlas.org. Surprisingly, not much is known concerning the mechanisms involved in regulating CK1 expression and kinase activity until now. The expression of CK1α can be down-regulated by the miRNA miR-155 . Treatment of cells with insulin, topoisomerase inhibitors, irradiation or viral transformation is able to increase CK1 activity . The subcellular localization of the CK1 isoforms is mainly regulated by binding to intracellular structures or protein complexes and thereby plays a role in substrate-recognition and CK1 activity [32–35, 37, 55]. Studies on the circadian rhythm in mice showed that the nuclear localization of CK1δ and CK1ϵ is regulated during the day . Posttranscriptional mechanisms are involved in the regulation of CK1α activity. In Hela cells two CK1α transcripts have been described which result from alternative splicing [79, 80]. The short 2.4kB transcript originates from the larger 4.2kB transcript due to the use of an alternative polyadenylation site. Interestingly, the longer transcript has six adenine uridine rich element (ARE) motifs in the 3'-untranslated region (in the short transcript there is only one ARE-motif), which lead to increased RNA degradation of the 4.2 kB transcript. Moreover, the long transcript harbors the above mentioned insertion of 84 bp or 28 amino acids in the catalytic domain, which also causes a change in substrate affinity . Only the long splice variants of CK1α have a nuclear localization sequence (PVGKRKR), which is responsible for the transport of CK1α into the nucleus . The activity of CK1 isoforms can also be regulated by post-translational modifications, in particular phosphorylations or proteolytic processing. For CK1δ and CK1ϵ it was shown that the C-terminal domain is autophosphorylated, which inhibits the kinase activity [82–84]. As mentioned earlier, CK1ϵ is activated after Wnt3a stimulation by the removal of inhibitory C-terminal phosphorylations. The responsible phosphatases are not identified yet. Furthermore, part of the C-terminal domain can be cleaved, which increases kinase activity . In addition, the three dimensional structure of CK1δ plays a role in the regulation of activity. CK1δ forms dimers leading to an inhibition of kinase activity . Allosteric regulatory mechanisms were recently identified by two working groups and seem to be major determinants of CK1 kinase activity. Cruciat et al. showed that ATP-dependent RNA helicase DDX3X (DDX3) binds to CK1ϵ thereby allosterically activating the kinase domain and triggering canonical Wnt signaling. Using biochemical methods this novelty in kinase regulation was extended to the isoforms alpha, delta and gamma2 . It is estimated that different DDX proteins can allosterically activate these CK1 isoforms (up to five fold). In line with these findings was the identification of the CK1α activating drug pyrvinium. This anthelmintic can bind to all CK1 isoforms but activates only CK1α due to conformational changes, thereby strongly inhibiting canonical Wnt signaling . The evidence obtained in recent years emphasizes the importance of CK1 isoforms in cancer progression in different types of tumors . Microarray database analyses from tumor cell lines (http://discover.nci.nih.gov/cellminer/analysis.do) and tissues (http://www.broadinstitute.org/cancer/software/genepattern/datasets/;RamaswamyMulti-cancer) indicated that the CK1δ and CK1ϵ isoforms are overexpressed on RNA level in many tumor types. This includes cancers of bladder, brain, breast, colorectal, kidney, lung, melanoma, ovarian, pancreatic, prostate and the hematopoetic system. Expression of the CK1γ1-3 isoforms seems to be rather low in different cancers types (Figure 2A, B). In addition, it has been shown that CK1δ is overexpressed in cells of hyperplastic B cell follicles and B cell lymphomas in p53 deficient mice . In renal cell carcinoma increased CK1γ3 expression was found . In choriocarcinoma an increased expression of CK1δ  and in ductal adenocarcinomas of the pancreas an increased expression of CK1δ and CK1ϵ was detected . A tabulary overview can be found in the recent review of Knippschild et al. . Expression of CK1 isoforms in cancer. (A) Shown are the color-coded RNA expression levels of CK1α, δ, ϵ, γ1, γ2, ϵ3 (CSNK1A1, CSNK1D, CSNK1E, CSNK1G1, CSNK1G2, CSNK1G3) in different tumor types as determined by the CellMiner database for gene expression analysis of 60 cancer cell lines from the NCI60 panel. Z-scores for the six isoforms were calculated and subjected to the Gene-Pattern analysis software for heatmap generation using the Gene-Pattern online tools (http://genepattern.broadinstitute.org/gp/pages/index.jsf). Blue depicts low expression levels and red high expression levels. 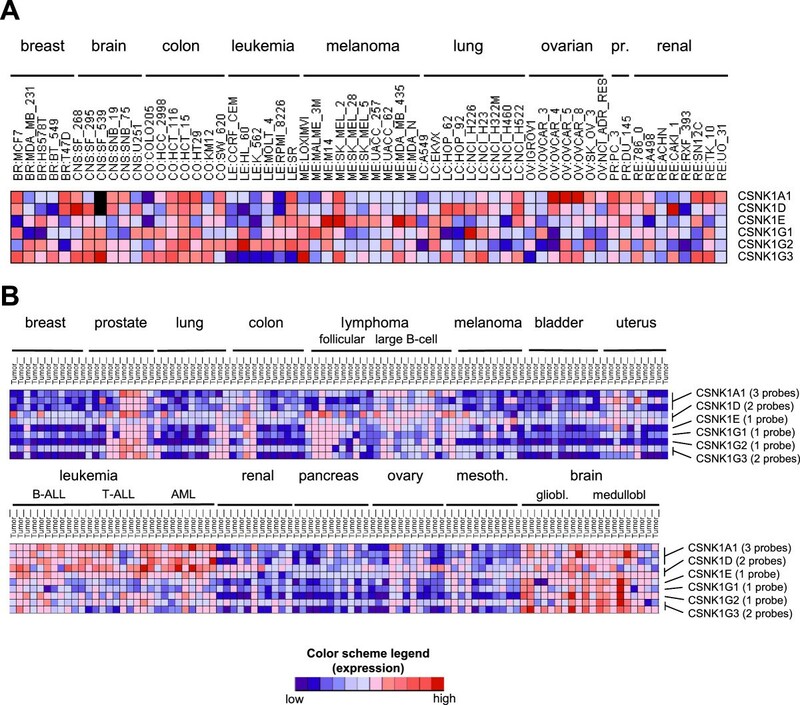 (B) The Ramaswamy Multi-cancer dataset (public available at http://www.broadinstitute.org/cancer/software/genepattern/datasets/) was used for analysis of the z-scored expression levels in different tumor tissue samples and again used for heatmap illustration. RNA expression of CK1α is more variable with high expression in cancers of the brain, prostate, lymphoma and especially in leukemia (Figure 2A, B). In bladder cancer, lung cancer and melanoma there is a trend to decreased RNA expression of CK1α (Figure 2A, B). Expression analysis of CK1α in melanoma datasets of the oncomine.org expression database clearly revealed a reduction in mRNA expression during melanoma progression. We confirmed the reduction of CK1α expression on protein level . The downregulation of CK1α expression in progressed melanoma tumors seems to be mainly mediated by promoter methylation of the CK1α gene . In contrast, there is one recent report claiming that CK1α expression is higher in melanoma compared to benign nevi . The expression data suggests that there are tumor-cell specific differences in the functional activities and/or relevance of CK1 isoforms in cancer. However, to gain information about the relevance of the different CK1 isoforms in tumor progression, the CK1 protein expression as well as the kinase activity should be determined since it is known that CK1 activity is regulated by posttranscriptional mechanisms and posttranslational modifications (see above). Several CK1- substrates (see Table 1) are known to play a role in tumorigenesis and are substrates of different CK1-isoforms. Therefore it will be important to clarify the redundancy in the activity of different CK1 isoforms. Furthermore, the mechanisms regulating CK1 expression and activity in tumor cells are still not well understood. Despite promoter methylation  mutations could play a regulatory role. In breast carcinoma, mutations were found in the coding region of the CK1ϵ gene . In colonic adenoma, R324H mutations are described in the CK1δ gene, and these were correlated with an increased oncogenic potential of the lesions including a higher transformation potential in vitro. Interestingly, the R324H mutation did not significantly alter the CK1δ kinase activity or the Wnt/β-catenin signaling activity in vitro but had strong impact on the morphological movement like secondary axis formation in Xenopus embryos. Mutations in CK1 isoforms seems to be rare, however, copy number variations seem to be more frequent (see http://cancer.sanger.ac.uk/cosmic). Analysis of the actual datasets of the cancer genome atlas (TCGA) available at the cBioPortal for Cancer Genomics [94, 95] revealed the mutation pattern and copy number alterations (CNA) in 24 different tumor types (Figure 3). The total alteration frequency including CNAs and mutations is generally rather low ranging from 4.8% in clear cell renal cell carcinoma (ccRCC) for CSNK1A1 over 9.5% in liver cancer for CSNK1D to 3.8% for CSNK1E in melanoma tumors. Specific point mutation frequencies are even lower and do not exceed 2.4% (as for CSNK1A1 in bladder cancer, for CSNK1D in lung squamous carcinoma and colorectal or pancreatic cancer; point mutations in CSNK1E seem to be very rare). Moreover the distribution of the detected mutations along the primary structure of the CK1 isoforms shows no accumulation in certain domains or regions which excludes the occurrence of hotspot mutations like in BRAF or TP53 (Figure 3A). Therefore genomic alterations of CK1 isoforms which lead to functional hyperactivity or defects may occur, however they seem to be seldom events. Mutations in CK1 isoforms and cancer patient survival. (A) Mutation analysis of CK1 isoforms and overall survival of tumor patients stratified in CK1 isoform expression classes. 24 different tumor entities were analyzed using the cBioPortal for Cancer Genomics [94, 95] accessing the newest TCGA datasets. The highest mutation frequency for CK1α was detected in clear cell renal cell carcinoma (ccRCC) with approx. 4.8%, for CK1δ in liver cancer with approx. 9.5% and for CK1ϵ with approximately 3.8% (top diagrams). The distribution along the primary structure of the three CK1 isoforms α, δ and ϵ was analyzed in the cBioportal using all available datasets (69 cancer studies containing data of 17584 tumor samples). No hotspot mutation could be identified and only very low mutation frequencies were found (bottom diagrams). In comparison, analysis of the oncogene BRAF and the tumor suppressor TP53 revealed high mutation frequencies and the hot spot mutations at BRAFV600D/E/K/R or TP53R273C/H/L/P/S/Y. (B) Survival analysis of stratified cancer patients into high and low CK1 isoform expression (determined by microarray gene expression analysis) was performed using the PPISURV online tool . The studies showing the highest significant differences in overall survival (OS) between CK1high and CK1low patients are shown as Kaplan Meier curves for the α, δ and ϵ isoforms (CK1 high expression in red, CK1 low expression in green). What are the functional consequences of deregulated CK1 expression in tumor cells? On a functional level it was reported that CK1ϵ enhances the β-catenin-dependent proliferation in breast cancer . However, it was recently shown that patients with oral cancers who had a loss of CK1ϵ expression had a poorer overall survival rate than patients who expressed CK1ϵ . For CK1δ it was shown that a point mutation in the C-terminal regulatory domain of CK1δ (R342H) promotes the emergence of colorectal adenomas independent of Wnt-/β-catenin . In contrast, a downregulation of CK1δ and ϵ-isoforms induced cell cycle arrest and apoptosis in a variety of tumor cell lines of different origin. These effects were also Wnt/β-catenin-independent, but dependent on activated RAS and inactive p53 [5, 99]. It was also shown that impaired CK1δ activity attenuates SV40-induced cellular transformation in vitro and mouse mammary carcinogenesis in vivo. Thus, depending on the experimental setup and the tumor type CK1-isoforms seems to have a specific and non-redundant role in tumorigenesis, however the results are often contradictory. One reason might be that CK1 isoforms have also a regulatory function, which is independent of the kinase activity. It was described that CK1ϵ can interact with mitochondrial proteins in ovarian cancer cells and by this, increase growth and survival of the tumor cells in a Wnt/β-catenin independent manner . Until now most hints pointing to an important role in tumor progression have been described for CK1α. Our own previous work support the observation that CK1α in comparison to the other CK1 isoforms have a dominant and non-redundant function in metastatic melanoma cells . We identified CK1α as a novel tumor suppressor and a key regulator of β-catenin signaling in melanoma cells. Knockdown of CK1α in primary melanoma cell lines significantly enhanced the invasive capacity of melanoma cell lines in vitro. This pro-invasive effect after CK1α knockdown was reversible by inhibition of β-catenin signaling, demonstrating the dependence of the invasive phenotype on β-catenin in melanoma cells. Moreover, knockdown of CK1α in a melanoma xenograft model using melanoma cells with low intrinsic tumorigenic potential strongly increased tumorigenicity and stabilized β-catenin . In line with, one study showed that a pharmacological increase of CK1α protein level and thereby a destabilization of activated β-catenin significantly diminished melanoma cell migration . Interestingly Chien et al. found high β-catenin levels to be rather a good prognostic marker in melanoma as well as to inhibit invasion probably by the promotion of differentiation in conjunction with MITF [103, 104]. In another recent study Chien et al. described a bad overall survival of BRAF inhibitor treated patients with tumors expressing high β-catenin protein levels. This reveals that the different results probably refer to different, so far non-identified melanoma subtypes . Furthermore, the activation of CK1α kinase by the above mentioned allosteric activator pyrvinium induces cell death in colon carcinoma cell lines . However, pyrvinium was recently described to elicit cytotoxicity in a CK1 independent manner by AKT downregulation and GSK3 activation in 293 T cells  and it is known to inhibit the unfolded protein response by GRP78 suppression  as well as cancer cell protective autophagy . During melanoma progression CK1α expression is lost and is not necessary for survival and cell cycle progression in metastatic melanoma cells. Overexpression of CK1α retarded proliferation of metastatic melanoma cells and induced cell death, whereas the primary melanoma cell lines were mostly unaffected in their cell growth. This is consistent with the data showing that re-expression of CK1α in the lung cancer cell line A549 in which the expression of CK1α is also low causes reduced cell proliferation in vitro and tumor growth in vivo. Our results suggest that the effect of CK1α on proliferation and invasion of melanoma cells in different stages of growth is at least partly due to an effect on the Wnt/β-catenin signaling pathway [44, 101]. The effect of CK1α on tumor progression seems to be also dependent on the activity of the tumor suppressor p53. One study shows that loss of CK1α in the intestinal epithelium of mice leads to hyperproliferation but not to tumor development. An additional inactivation of the p53 tumor suppressor gene or its target p21 is necessary to ensure the emergence of high-invasive colorectal tumors . This suggests a non-redundant and dominant role of CK1α compared to the other CK1 isoforms not only in melanoma, but also in colorectal tumorigenesis. Moreover expression levels of CK1α seem to be a predictive survival marker in colon cancer patients with non-functional p53. Low CK1α expression levels were shown to correlate with poor survival rates and a significant hazard ratio of 4.7 hinting at a pro-oncogenic function of loss-of-CK1α on a p53 deficient background . Furthermore, CK1α knockdown as well as additional inactivation of p53 is necessary for tumors to progress. If p53 is present, tumor cells will be eliminated by cell cycle arrest or apoptosis. This assumption was verified recently in acute myeloid leukemia, where it was shown that inhibition of CK1α has only a therapeutic effect, when p53 is active . In the concept of tumorigenesis oncogenes play a pivotal role. However, excessive proliferative signaling as well as sustained DNA damage response can trigger cell senescence, commonly associated with a senescence-associated secretory phenotype (SASP). The secreted proteins include proinflammatory chemokines and tissue remodeling factors that have on the one hand an autocrine, senescence reinforcing effect and on the other hand a paracrine effect on neighbouring cells, leading to bystander senescence and immune cell recruitment. Interestingly, in cancer, SASP can increase proliferation and invasion of tumor cells or induce angiogenesis. Another recently described pattern of secreted proteins from senescent cancer cells can be subsumed as senescent-inflammatory response (SIR) resulting in a cell-autonomous initiation of inflammation, causing colonic tumor progression in a p21 deficient background. Usually, knockdown of CK1α induces p53/p21 mediated arrest and a senescent phenotype in p53 functional cells . The group of Ben-Neriah found out that in p53 (or p21) deficient murine gut tumor cells the SIR factors that occur after CK1α knockdown induce pro-invasive genes like PROX1 thereby causing highly aggressive and hyperproliferative tumor cells. The described effect was highly dependent on the inflammatory response itself . This shows that CK1α is a negative regulator of the SIR and loss of CK1α causes oncogene-like chronic stress which induces a pro-oncogenic switch to cell-autonomous, tumor promoting inflammation when p53 is inactivated. In order to show the impact of CK1 isoforms on tumor progression we analyzed the survival of different cancer patients (17 types of cancer) depending on the gene expression levels of the three CK1 isoforms α, δ and ϵ using the PPISURV database , This database includes 45 expression studies with approximately 8000 patient survival data sets. 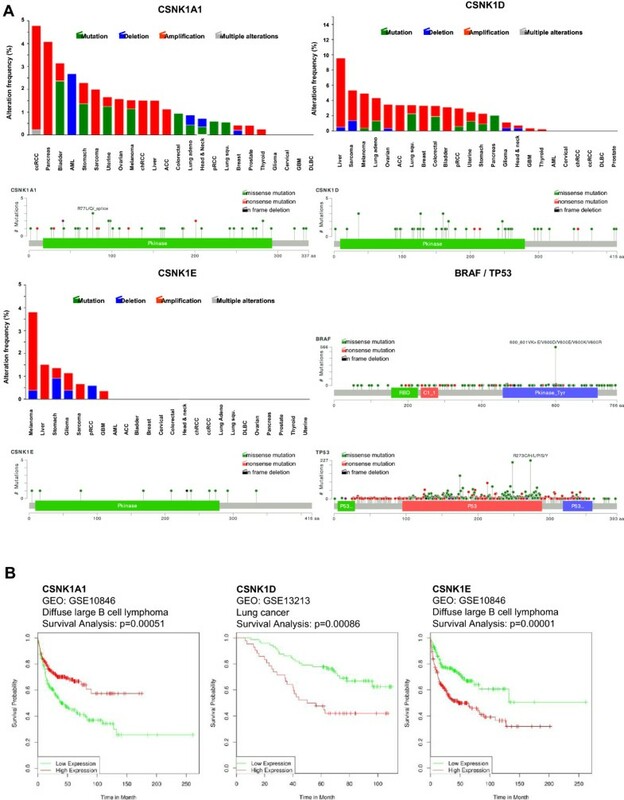 Analysis revealed after stratification of the patients into the two classes high and low CK1α expressing tumors a significant correlation between prolonged overall survival (OS) and high expression levels for 12 (B cell lymphoma, breast cancer, leukemia and lung cancer) out of 17 studies, whereas in 5 studies (lung cancer, colon cancer and liposarcoma) patients with high expression levels did worse. For CK1δ there was positive correlation between high expression and longer survival in 6 (breast cancer, leukemia and glioma) out of 9 studies (3 correlated negatively) and for CK1ϵ there was a rather mixed picture with 4 positive (glioma, lung cancer and leukemia) and 4 negative correlating studies (B cell lymphoma, breast cancer and lung cancer) (Table 2 and Figure 3B). The higher number of significant studies showing a positive prognosis for patients with high levels of CK1α expression hints to the postulated function as tumor suppressor in some cancers whereas the mixed pattern for CK1δ and especially CK1ϵ depicts a context dependent function of the isoforms being either pro- or anti-tumorigenic. However, it remains uncertain whether the CK1δ and ϵ isoforms represent drivers of tumorigenesis or if their disregulation and altered expression is rather the consequence of other cellular oncogenic events. Therefore critical genetic validation models should be developed in order to prove the concept of CK1 isoforms as important regulators in tumorigenesis besides the development of specific pharmacological inhibitors. Due to the above described involvement of CK1 isoforms in tumorigenesis pharmacological inhibition of CK1 familiy members could be of interest for targeted cancer therapy. However, the development of isoform specific inhibitors seems to be a demanding task since the first known inhibitors like the ATP-competitive type I inhibitors CKI-7 or IC261 are not highly specific and show a rather broad effectivity against CK1 isoforms with a predominance for δ and ϵ. IC261 showed activity against pancreatic tumors in a xenograft mouse model  as well as in a MYC-driven neuroblastoma model . Meanwhile, it is known that IC261 also efficiently inhibits the polymerization of microtubules in a CK1 independent manner, Therefore it is questionable whether the anti-tumorigenic effects are due to selective inhibition of CK1δ. D4476, another CK1 inhibitor which shows some selectivity towards the δ isoform, was successfully applied in a leukemia mouse model causing the elimination of the tumor cells. However, since the α isoform seems to be dominant for the described mechanism in this model by Jaras et al., the effects measured with D4476 might result due to the inhibition of additional susceptible isoforms and drug targets like CK1δ or the TGF-β type-I receptor ALK5. Huart et. al reported a novel inhibitor belonging to the class of pyrazolo-pyridine analogues that strongly inhibits CK1δ in conjunction with CHK1 thereby activating the p53 pathway and inducing apoptosis in A375 melanoma cells. However, a similar analog described in the same study but lacking the CHK1 inhibitory function showed no apoptosis induction in A375 cells . Further developments were undertaken by Bibian et al. in order to generate highly specific CK1δ/ϵ inhibitors resulting in a series of purine scaffold inhibitors (SR-1277, SR-2890, SR-3029) with IC50 values in the low nanomolar range. These inhibitors were also highly potent in inhibiting A375 melanoma cell growth in a MTT viability assay. Interestingly, the inhibition with less specific inhibitors like D4476 or PF670462 did not show these inhibitory effects, proposing a better cell penetration of the SR inhibitors and better efficacy . In order to exclude any of the remaining very few off-targets to be the main originators of the effects on A375 melanoma cell viability, genetic tests (like knockdowns or knockouts) targeting CK1 isoforms should be performed. Further studies will be needed to determine the cellular efficacy and specificity of these interesting novel CK1 inhibitors. For detailed further information about the development of additional CK1 inhibitors we refer to the excellent review by Knippschild et al. .
CK1 isoforms can influence the development and progression of tumor cells, although they seem to have different effects depending on the tumor types. Their ability to regulate several important signaling molecules is modulated in different types of tumors. This suggests that CK1 isoforms might be suitable targets for clinical intervention. Especially their ability to regulate p53 and Wnt-signaling, cell cycle progression and apoptosis induction makes them attractive targets in tumor therapy. Since the CK1 isoforms seems to have sometimes opposing roles in different tumor types it will be essential in future to validate the effect of specific CK1 isoforms in defined tumor types on cell cycle progression and signal transduction. Since several kinase inhibitors are in pre-clinical development there is hope that, among these, some of the most effective inhibitors could delay or inhibit tumor progression. This work was supported by the Deutsche Krebshilfe (110210) and the intramural funding program of the medical faculty of the University of Tübingen (fortüne 2198-0-0). BS and TS wrote the manuscript. Database analyses and figure preparation were done by TS. Tables were created by BS and TS. Both authors read and approved the final manuscript.